Troma Entertainment recently sent us information for their upcoming blu-Ray release of "The Middle Finger". The film stars Seamus Hanly, Rebecca Dore, Rose Henderson, Matthew Kelly and Iseult Casey. Special features includes Making of the Helmet Featurette, Outtakes, Director's Commentary, Music Videos, Trailers and More Tromatic Extras! 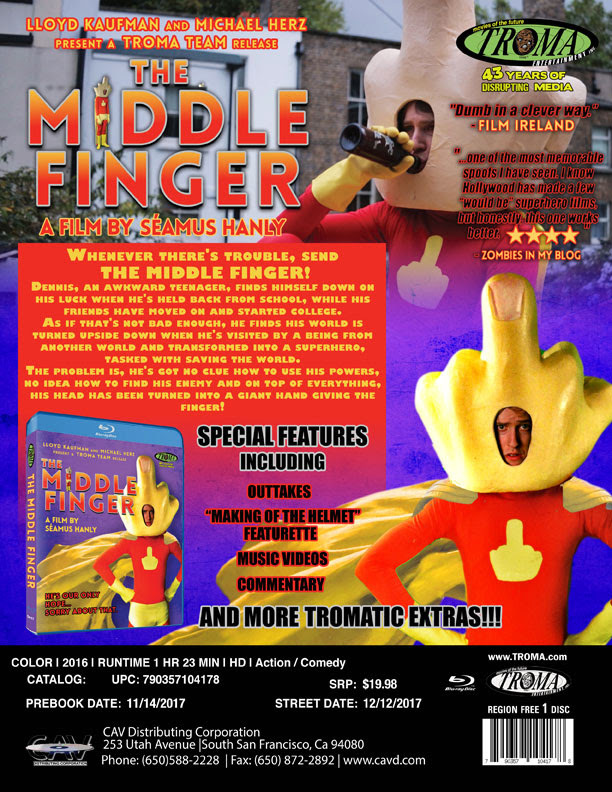 "The Middle Finger" hits retail on December 12th. Whenever there's trouble, send The Middle Finger! Dennis, an awkward teenager, finds himself down on his luck when he's held back from school, while his friends have moved on and started college. As if that's not bad enough, he finds his world is turned upside down when he's visited by a being from another world and transformed into a superhero, tasked with saving the world. The problem is, he's got no clue how to use his powers, no idea how to find his enemy and on top of everything, his head has been turned into a giant hand giving the finger!